An old-fashioned buttermilk biscuit OR a generous layer of hash browns piled high with Daily’s ham and two eggs, and topped with delicate cheese sauce. Eggs scrambled with juicy Daily’s ham, green peppers and onions, served with salsa, hash browns and toast. Two eggs any style, smothered in your choice of red or green chili. Includes hash browns and choice of toast, biscuit or tortilla. For the hearty appetite! Two buttermilk biscuits and homestyle sausage gravy with two eggs and your choice of sausage, Daily’s bacon or ham. Two eggs served with hash browns and toast (or two eggs served with three hotcakes). Light ’n fluffy pan-cooked three-egg omelettes prepared from scratch, served with hash browns and toast. with cottage cheese and tomato? Add 99¢. With crispy fried Daily’s bacon, fresh-sliced mushrooms, onion, and cheddar cheese. Choose sausage, Daily’s ham or Daily’s bacon, add cheddar, Swiss, jack or American cheese. Fantastic! With fresh-sliced mushrooms and tangy melted Swiss cheese. With cheddar cheese, peppers and onions, topped with rich Depot Salsa. With cheddar cheese, peppers and onions, smothered in red or green chili. One egg cooked the way you like. Add Meat Bacon, Ham, Sausage or Hamburger. Add Cheese Cheddar, Swiss, American, Monterrey Jack Or Pepper Jack. Choose an English Muffin or a Biscuit. Classic French Toast loaded with your choice of meat, your favorite cheese and an egg if you choose. Served with hashbrowns on the side or on top. Three slices of French bread, dipped in a rich coating and cooked ’til golden, served with warm maple syrup. Served from 5am to 11am. Plate-size delicacy cooked ’til golden, with sweet whipped cream topping. Your choice of strawberries or blueberries. Hotcakes are served with warm syrup and butter. Two fluffy homestyle biscuits under rich cream gravy. Two fluffy homestyle biscuits with country sausage gravy. Warm and delicious with butter and gooey glazed topping. Large cinnamon roll served warm with sweet 'n gooey strawberry topping. Half order of Daily’s bacon, Daily’s ham, hamburger patty or sausage, with one egg cooked to your liking. Served with two small hotcakes, or with hash browns and one slice of toast. One half waffle with two link sausages or Daily's bacon. Two small hotcakes and two link sausages or Daily’s bacon. One slice of French toast with two link sausages or Daily’s bacon. One Biscuit with Gravy and two link sausages or Daily’s bacon. Made fresh "from scratch" in our kitchen! Take your pick - red or green! Rich and creamy, with a generous portion of Eastern oysters. The classic salad meal! Fresh greens topped with Daily’s ham, turkey, cheddar and Swiss cheese, hard-boiled egg, tomatoes, cucumbers, and green pepper. Low carb! Crispy greens and hard-boiled egg, tomatoes, cheddar and Swiss cheese, cucumbers and green pepper, all topped with a hot charbroiled or crispy breaded chicken breast sliced into pieces. *Soup & salad bar purchase is for one person only. 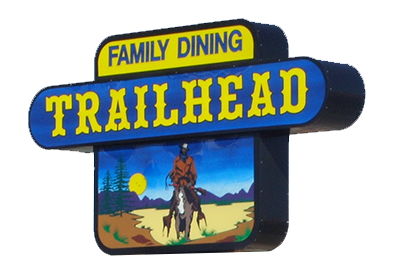 Featuring delicious hot homemade soup and a trail-size selection of fresh-made salads and fixin’s! Lightly breaded chicken breast strips deep fried ’til golden, and served with your choice of potato and dipping sauce. Fresh-deli sliced roasted beef with mashed potatoes and rich brown gravy. Hand pulled fresh-roasted turkey with mashed potatoes and gravy. 1/3 lb. patty smothered in rich beef gravy, served with mashed potatoes. Sandwiches are served with fresh-cut or shoestring fries, mashed with gravy, hash browns, potato salad, or soup. Breaded or grilled chicken breast served on a warm bun with lettuce, tomato and mayonnaise. Flaky white fish coated with a crispy Southern-style coating, deep fried to a golden brown served with lettuce, tartar sauce and lemon wedge. Big triple-decker with Daily’s ham, turkey, Daily’s bacon, cheddar, swiss, tomato and lettuce. The classic B.L.T. with crispy Daily’s thick-sliced bacon. An old time favorite with your choice of cheese. Served with lettuce, tomato, and a pickle spear. Corned beef stacked tall on rye bread, with melted Swiss and topped with sauerkraut. Breaded or grilled chicken breast topped with sliced Daily’s ham and Swiss cheese, served on a large toasted bun with lettuce and tomato. Savory hand-sliced beef on a warm hoagie bun, served with hot au jus. With grilled onion, Swiss cheese and horsey sauce. Burgers served with fresh-cut or shoestring fries, hash browns mashed with gravy, potato salad, or cup of soup. The original burger served with pickles, tomato, lettuce, and onion. Choose your cheese: Cheddar, Jack, Swiss, American or Pepper Jack. Charbroiled burger topped with fresh-sliced sauteed mushrooms and onions, crumbled Daily’s bacon, cheddar and Jack cheese. Twice the meat served with all the goodies. With crispy thick-sliced Daily's bacon and your choice of cheese. Your choice, red or green! With cheese ’n onions. Topped with fresh-sliced sauteed mushrooms and Swiss cheese. Grilled on rye with Swiss cheese ’n onions. Swiss cheese and chunky blue cheese on top. A heaping basket of deep-fried shoestring potatoes. Top a basket of fries with melted cheese sauce. A pile of fries topped with red or green chili, and cheese sauce. ... with our special sauteed blend of fresh-sliced mushrooms, onions, and crispy Daily’s bacon bits! Tender cubed steak hand breaded and cooked to golden brown perfection. Simply delicious. Friday and Saturday after 5 p.m. - while it lasts! Tender and juicy roast prime rib carved to your individual order. Two choice chops, lightly seasoned. Tender beef liver topped with crispy Daily's bacon and tender sauteed onions. Pasta selections include one trip through our soup & salad bar, and garlic bread or dinner loaf. Pasta available after 11 a.m.
Charbroiled or Breaded chicken with fettucini in a rich Alfredo sauce. Fettucini tossed in our rich Alfredo sauce. Seafood dinners include one trip through our soup & salad bar, lemon wedges, your choice of a side, and garlic bread or dinner loaf. Butterflied and tavern battered, with tangy cocktail sauce. Delicious torsch (cod) served in real butter. You will love this one! Includes one trip through our soup and salad bar, your choice of fries, mashed with gravy, or hash browns, and a loaf. Pasta dishes include one trip through our soup & salad bar, and garlic bread or a dinner roll. Tossed with our Alfredo sauce. Charbroiled or breaded chicken with fettuccini in our rich Alfredo sauce. Free refills of coffee and soft drinks with your meal.